When one buy's direct mutual funds on the basis that there'll be earnings of an extra 0.5-1.5%, then it's time for a reality check. With the state of India's economy being volatile, investors all across are scrambling to either withdraw their current investments or look for opportunities that can offer long-term returns. More and more investors, from all across the economy, are turning to mutual funds, for their investment needs. This is evident from the fact that the MF industry has grown at an average of 25% in the past one year. In comparison to stocks, Mutual Funds offer diversified portfolio and risk management which makes them an attractive proposition. These days, Direct Mutual Funds are getting a lot of traction in India. This is in contrast to the already established distributor model of mutual funds where the investor pays a fraction of commission, usually 0.5-1.5%, to the mutual fund distributor. With the advent of digital platforms like Sqrrl, PayTM Money, ET Money, etc., mutual fund adaption is on the rise among new investors. This is in part because of various factors like live tracking of investments, easy onboarding, hassle-free ways of fund selection, etc. But the past few years have seen the industry's onus shift from helping the investors get their financial goals to a battle between direct & regular mutual funds. Most digital mutual fund platforms are turning to direct mutual funds broadcasting, facilitating the extra 0.5-1.5% that the investors can earn in the absence of the commission that is paid in case of regular funds. An important aspect of picking the right mutual funds for our goals is aligning the goals with the fund's portfolio and philosophy. The expertise and experience of the fund manager also comes into play here. On this, Sqrrl CEO & Co-founder, Samant Sikka, says, "It is true that direct plans offer slightly higher returns than regular plans. But the funds that the investor actually ends up investing in should not depend upon this marginal performance. Rather on how well does the ideology of the fund manager and fund's portfolio aligns with the investor's own goals. This is a space where the goals of the investors matter more than the percentage of returns." 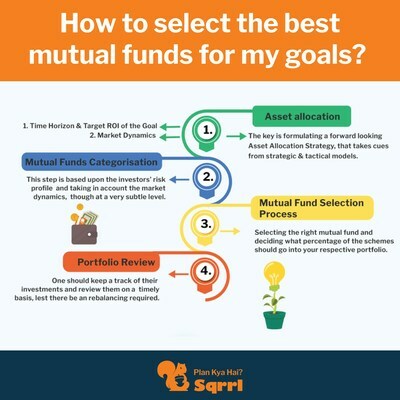 Incidentally, Sqrrl makes use of a personalised recommendation engine to suggest direct mutual funds to its users based on their goals. The goals can be both long-term and short-term and based on the time-period for which users wants to invest and the amount they want to invest, they can select the best option, while evaluating the expected returns. A reduction in TER or lower commission rates will benefit investors surely, but it does not impact the performance of a mutual fund. A mutual fund scheme's performance would depend upon the fund manager's ability and the market performance. And investors should definitely give more value to the fund's performance than its expense ratio or whether it is regular or direct. Sqrrl is a personal finance brand aimed at helping users realise their dreams and goals, by investing in top performing mutual funds. It uses advanced technologies like cognitive computing to recommend customised investment plans based on a user's investment needs, risk horizons and goals. Further, it has a unique feature that helps users to micro save, by rounding up their left over amount during their spending, to the next 100 or 500, making it extremely convenient for young generation to save while they spend. The app is available on both Android and Apple. Sqrrl was among 23 hottest Indian startups to get selected at the Reliance GenNext Hub - an accelerator program run by Reliance Industries & Microsoft ventures, picked from an initial list of 1200 applicants. They recently also got featured in the #Hot100 Startups in India: Race to Grace 2017. The company now has customers across 700+ cities in India and is aspiring to touch the 3 million mark in its overall customer base.